You can listen to '32 jaar' here. I am not going to write about the recently released box containing all of Doe Maar's recordings here at all, as this box does not add anything to my experience with the band over the past 30 something years. For those not familiar with Doe Maar. This band is The Netherlands' most popular band singing in Dutch ever. Although its heyday was between 1982 and 1984 only and in that period during the last year already waning, the craze of (pre)teenage girls for the then already 30something band members let to the band's demise as well as its eternal fame. Once people were able to look beyond the teenage tears and screams a collection of great songs became apparent. In 2012 Doe Maar is into its third reunion cycle and still attracting so many people it fills whole stadiums with them. I'm just thinking that the band, now well into its sixties, is really enjoying itself and may just start recording a new album in 2013, to follow up on 2000's 'Klaar'. My personal experience started with a single around 1979. The almost ballad 'Ik zou het willen doen' was sort of o.k. but not the sort of music I fancied at the time. This became somewhat different with '32 jaar (sinds een dag of twee)' and 'Smoorverliefd' in 1981. The music was reggae infused with clear pop and a little rock flavour. Not unlike many other bands of the period. The Police, early Joe Jackson, The Specials and Madness. The two songs became radio staples at the time (and to this day) and '32 jaar' a small hit. Through the cover of 'Skunk', the second LP, pink and green later became Doe Maar colours. It was in the summer of 1981 I got to see them play live as a bonus as they supported Dexys Midnight Runners (read on Dexys here) at a live show in Brouwershaven organised by Dutch national radio station VARA. Doe Maar stood out as they played good, with loads of enthusiasm and added different songs to what I usually listened to. Enough for me to buy 'Skunk', the second album, straight away. 'Nix voor jou' is still playing in my head regularly and was a major favourite in my college days, finding our way home in the middle of the night, waking up people singing "Early morning and I'm looking for my socks' as loud as we could. (I apologise here and now for having loads of fun.) The addition of Joost Belinfante at the concert playing trombone and what not obviously added to the quality and diversity of the show. Doe Maar moved and made us move. And no little girls in sight anywhere. 1982 brought 'Doris Day en andere stukken'. Again a great album which I play to this day. Next to the two hitsingles 'Doris Day' and 'Is dit alles', songs like 'Belle Hélène', 'Radeloos', 'Okee' and 'Liever dan lief' are just great songs. No doubt about it. For the band that year somewhere things took a wrong turn as they never aimed at such a young audience and fans. Perhaps at first it was fun, but things went wrong publicly and privately. 1983 came with the first number 1 hitsingle 'De bom'. Fantastically insync with the time of anti bomb and anti-nuclear mass protest. '4us' was an album I did not particularly like, although it contained Doe Maar's second #1 'Pa'. A song like 'Je loopt je lul achterna' was not exactly what 13 year olds could relate to, nor what their parents wanted their kids to hear. Cynical and harsh was where Singer/Bassist Henny Vrienten was at at the time. The same goes for the anti-heroin song 'Heroin' and '1 nacht alleen'. 1984 single 'Macho' was a fairly weak song and I was not surprised that the band called it quits soon after. Doe Maar was over and finished, only two years into real fame. Burned up and spent, the way all teenage idols end after a few years. Put aside ashamed by then 15 year old girls and no one else wants to be associated with them. Still, I noticed that they had real fans during my college years, in the second half of the 80ties, as we were reminded time and again that a lot of Doe Maar's songs had a quality that would stand time. And then it happened from late 1999 onwards, when Doe Maar announced the come back tour. One show in Ahoy became 16 shows and a great album, that almost nonchalantly made clear to us all what we had missed in the 16 years in between, had the band just taken a rest. 18 fantastic songs at a high level of quality were offered on 'Klaar'. In 2008 and 2012 Doe Maar filled stadiums and now they appear to go on an extended club tour in 2013. Everything is now available in one box. Pop, reggae, ballads, a little rock and new wave and great, great songs. 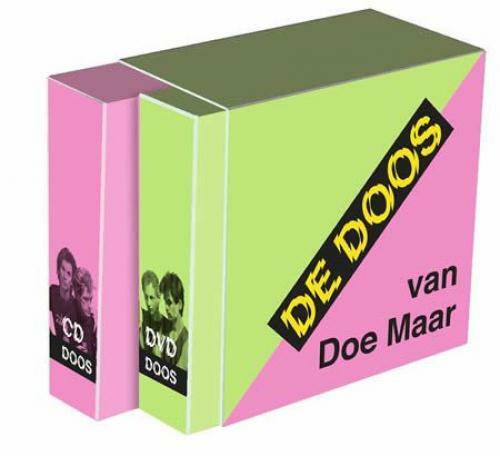 Doe Maar is one of Holland's best bands ever. There's no denying this fact in 2012.